ANN CURRY: In depth now, a powerful story of courage and a reminder of what is at stake in the war in Afghanistan, a war in which Islamic militants attack young girls whose only offense is going to school. NBC’s Jim Maceda reports now from Kandahar. JIM MACEDA: Thirteen-year-old Zahara always looked forward to school, to science class and athletics, until one morning last month, walking to the Mirwais Meena Girls’ School in Kandahar with her older cousin Chamsey. Here, just outside the school, her life changed. ZAHARA: (Through translator) It was Wednesday. We were coming home from school when men on motorbikes drove by and threw something on our face. MACEDA: Zahara thought it was water, just a prank, until it started to sting. ZAHARA: (Through translator) My skin became green, then white and I knew something was really wrong. MACEDA: Her cousin Chamsey screamed and passed out. She and five other girls were hospitalized with burns, all victims of a brutal acid attack by militants. In the eyes of the Taliban, girls are unholy if they go to school. Colonel MIKE MALLIN: It’s an event that really shook this place up, to be quite frank. MACEDA: For Colonel Mike Mallin, a former New York cop now training Afghan police here, it was an atrocity. Col. MALLIN: To see this happen to children just trying to go to school and get an education, better themselves and be part of the future success of this country. MACEDA: There have been hundreds of school-related attacks in Afghanistan over the past year alone, but nothing like this. Kandahar police say they’ve arrested four suspects, but refused to allow us to see them. Who does she think did this? ZAHARA: (Through translator) The enemy did it. MACEDA: Most of these kids were back in class after four or five days, but their teachers say the mood has changed. There’s still a strong desire to learn, of course, but now that’s mixed with a deep-seated fear. MACEDA: ‘We’re all afraid,’ said principal Mahmoud Qaderi, ‘but we don’t care. We’ll continue to teach and learn here, and that will defeat the enemy.’ Zahara admits she’s lost the joy to study, but not her dreams. ZAHARA: (Through translator) I want to be a doctor someday and give something to my country and its children. MACEDA: Her cousin Chamsey was left partially blind by her acid burns, but her sister had this message for the Taliban. MACEDA: ‘You can spray us a thousand times; we will not stop going to school,’ she swore, in tears. Two cousins, both victims of terror, and now the faces of defiance. Jim Maceda, NBC News. “Merry Christmas to all of the wonderful family and friends of the Afghan Regional Security Integration Command – South,” from the Soldiers, Sailors, and Airmen deployed in southern Afghanistan. Thank you for all of your love, encouragement, and support of Operation Enduring Freedom. FOB Walton— Recently Afghan national law enforcement agencies destroyed seized narcotics here, at the Regional Police Headquarters of the Afghan National Police. Present to watch the seized narcotics go ‘up in smoke’ were the Provincial Governor, Rahmatullah Raufi, the Regional chief of police, Brig. 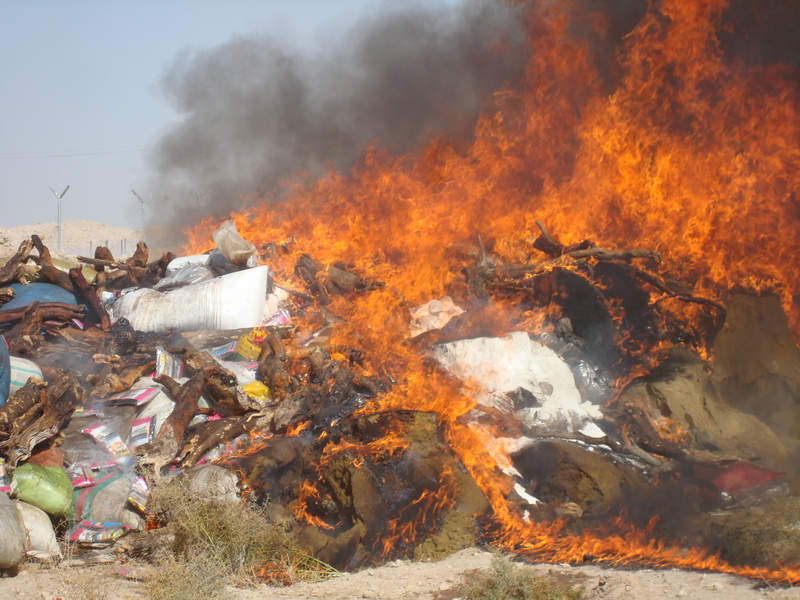 Gen. Ghulam Ali Wahdat, local Afghan commanders and Afghan government officials, members of the Regional Police Advisory Command- South led by Col. John Cuddy, the Commander, to witness more that 40 tons of narcotics and transformation products being destroyed. The drugs and related products destroyed were the result of the collaborative work of the Afghan National Police, the Counter-Narcotic Ministry, the National Development Strategy (NDS), and Afghan Border Police during the last few years. All illegal drugs (heroin, opium, hashish) and other chemicals were seized during police operations in the different districts of Kandahar Province. This event highlights the success, dedication, and the enduring and collaborative efforts of Afghan Government law enforcement officials in the Kandahar province in their struggle to provide their citizens a drug free, more secure, and stable homeland. Kandahar City— Recently, the Deputy Commander of 404 Maiwand Zone, Afghan National Police (ANP), Brig. Gen. Mirwaise Noorzai, orchestrated a Humanitarian Aid (HA) distribution at a local Kandahar City school. He was joined by the commander of the region’s Criminal Investigation Department (CID), Brig. Gen. Yousef Taryaedi, and the commander of the Police Sub-Station in Kandahar City, Precinct 1, Lt. Col. Gulab Shah. The school is used by about 200 students during the morning and about 300 students in the afternoon from the local community for ages five through 16. It took seven ANP Light Terrain Vehicle (LTV) pick-up trucks to carry all the HA supplies to the school, their flat beds loaded to overflowing with the blanket-wrapped packages and boxes of clothing. Items distributed by the local Afghan Uniformed Police along with members from the Regional Police Headquarters included staples such as food, prayer rugs, and blankets as well as items collected by family and friends of U.S. service members at the Regional Police Advisory Command – South (RPAC-S), such as school backpacks and other school related supplies, small toys, and personal hygiene items. 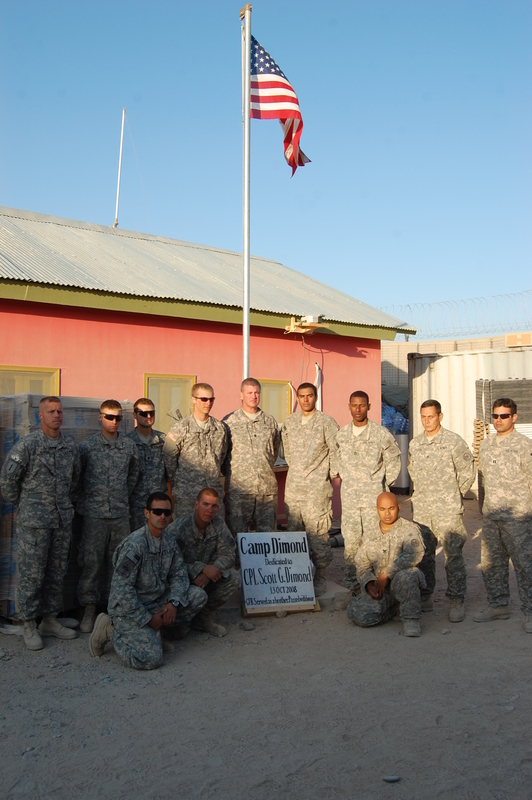 Lashkar Gah— Formerly known as Camp Falcon, the American compound here at the British base, was recently renamed in honor of a fallen comrade. An improvised explosive device (IED) took the life of Cpl. Scott Dimond, on October 13, 2008, in honor of his life the Camp here was recently dedicated to honor his memory. Corporal Scott G. Dimond, 39, of Franklin, New Hampshire was killed in action while the convoy he was traveling in came under attack in Kandahar City, Afghanistan. Cpl. Dimond was assigned to Charlie Company, 3rd of the 172nd Mountain Infantry Regiment of the New Hampshire Army Guard. Cpl. Dimond was a Police Mentor Team (PMT) member of ‘Easy Rider,’ helping to mentor the Afghan Border Police. After graduating from Franklin High School, he served on the Franklin Police force for 18 years as an Officer and a Sergeant. After retiring from the police force in 2006, he joined the Army National Guard. Cpl. Dimond outdid other Guardsmen during rigorous training prior to mobilizing to southern Afghanistan in support of Operation Enduring Freedom, despite being more than twice the age of many other soldiers. Cpl. Dimond began taking Pre-Med courses prior to leaving for Afghanistan in the hopes he could earn a nursing degree and work alongside his mother caring for aged and injured veterans. Cpl. Dimond will be remembered for being a dedicated father and police officer. He is survived by his wife, Jennifer, and his four children: Ashlee, Luke, Alexis, and Madison. “Scott, you are missed by all of us, served with honro with us, and will not be forgotten by any of us, “Lt. Col. Martini concluded.